The major health benefits of ginger are its ability to enhance the bone health, strengthen the immunity system, increase appetite, prevent cancer and menstrual cramps, improve digestion, remove excess gas, reduce nausea and treat flu and diarrhea. Ginger is one of the healthiest species in the world. It belongs to the family of Zingiberaceae and is closely related to turmeric, cardamom and galangal. The rhizome or underground stem or simply known as ginger has been widely used for centuries as a spice as well as an alternative medicine. It is also used in sweets and alcoholic beverages such as ginger wine and beer in many places. However in Asian cultures, it is also directly used by chopping it down for using its powder in traditional dishes and in soft drinks such as coffee and tea. Due to its revitalizing fragrance, it is used to make soaps, perfumes and cosmetics from ancient times. Its most familiar products are Gingerbread, ginger beer and preserved ginger. Every part of this versatile herb has strong powers. In China, it has been used for curing the inflammation and diarrhea for over the 2,000 years. In Ayurveda, it has been considered as the healing spice that can prevent diarrhea or air sickness, improve digestion and reduce joint pain. It is native to the southeastern Asia, India and China. The top producers of the herb include Jamaica, India, Fiji, Indonesia and Australia. Here we list nutritional values of ginger per 100 g (3.5 oz), percentage of RDA (Recommended Dietary Allowance) are roughly approximated using US recommendations for adults. The gingerols present in ginger act as effective ingredients to treat inflammation in joints and osteoarthritis. It not only cures existing irritability in bone joints but also prevents such ailments. Ginger has the merit of improving the immunity system of human body. Frequent intake of the herb in appropriate quantities makes the human health system ward off minor ailments like cough, cold etc. From ancient times ginger has been the choice for humans in treatment of stomach disorders, intestinal spasms and eventual diarrhea. It is found to have the remedial quality of setting right the digestive system. Ginger acts as a useful herb in deflating the blown up belly since it is found to have carminative and anti-flatulent properties. To remove the excess gas from the digestive system, it is used as a suitable food ingredient. Ginger has many in-built compounds that hasten the process of absorbing the nutrients and minerals into the digestive system. It activates imbibition and triggers up healthy hunger pangs and it is one of the main reasons for it has come to be known to act as a natural appetizer. The gingerols present in ginger which ascribe anti-inflammatory qualities are also found to be useful in thwarting the growth of cancerous cells in intestine. It thus, helps to prevent colorectal cancer. Sweating is one of the excretory functions of human body. Ginger is also found to promote sweating for detoxifying the body by ejecting unwanted impurities. Sweat also protects the skin from external harmful bacteria which cannot thrive due to the presence of dermicidin in sweat. When a human body undergoes a harmful phase, certain hormones called prostaglandins are secreted which send out alarming signals from the body like cramps, pains and fever. High levels of prostaglandins cause menstrual cramps, as believed by scientists. Ginger is found to reduce the levels of prostaglandins which lessen the intensity of cramps. Ginger is more popularly known for its quality of reducing vomiting sensation, roiling in the intestines and morbid feeling in the stomach. It gives quick relief from motion sickness, pregnancy related internal uneasiness due to its nature of being rapidly absorbed in human body. 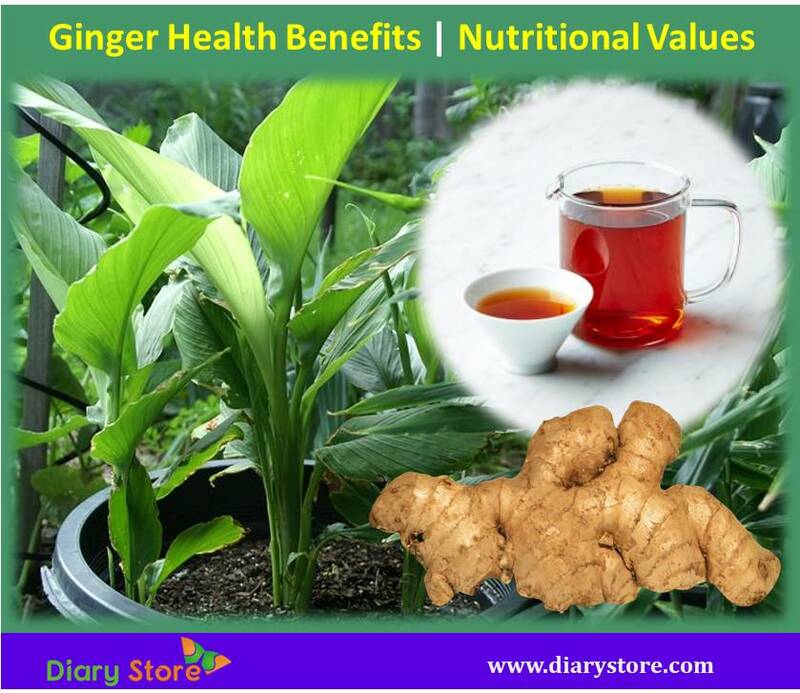 Various symptoms like body pains, throat congestion, difficulty in swallowing, bitter tongue high temperature of body that are caused due to attack of flu are ameliorated by ginger due to presence of prostaglandins. 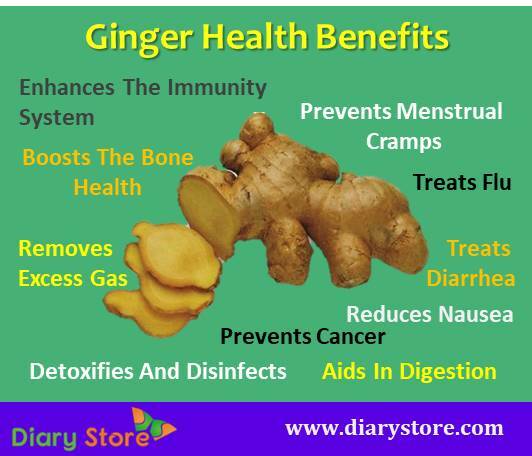 Ginger plays a good supplementary role in treating flu.